The Complete Idiot's Guide to Marshall Crenshaw. That's not my title, but the title of a great blog post at Jefitoblog that reviews and chronicles the career of one of the true power pop gods, Marshall Crenshaw, complete with downloads and YouTube clips from throughout the years. It's extremely well-written, well-thought and comprehensive, and I agree wholeheartedly with most of the thoughts about Crenshaw's various releases. (A few points of disagreement: I think the songs on Field Day are overall better than those on the debut, and I rate Life's Too Short higher than Mary Jane and 9 Others, but those are minor quibbles.) And I feel better now knowing that I'm not the only one who thought his most recent release, 2003's What's In The Bag?, was his worst and the only good thing on it was his cover of Prince's "Take Me With U". Hope everyone had an enjoyable Christmas and/or Hanukkah, and I appreciate all the feedback and readership associated with the top 100 list. As promised, here are the top 10 EPs of 2006. While nothing here listed quite approached the perfection of my top 2005 EP, David Mead's Wherever You Are, there are still some excellent releases here, and all are worth a listen. Coming very soon: My favorite tracks of 2006, and right around the first of the year, my early line on the best of 2007 from discs just released in the last couple weeks of December and some early 2007 advances. The Absolute Powerpop Top 100 of 2006. Here it is - hyped for weeks, finally here just in time to print out and hang on the Christmas tree. Or something like that. First, a few housekeeping notes. For the most part, I was true to the year of release. However, I made some arbitrary rules about a few 2005 releases. For reasons explained earlier, Andrew LeDrew's Ladies Lookout is on this list because its original fall 2005 release was limited to a select few in Canada. On the other hand, I am not ranking Pop Is Art's Epiphany (even though I did before) or Millicent Friendly's Downtime, even though they're both popping up on a lot of 2006 lists despite a 2005 release date. Also Roger Joseph Manning Jr's The Land of Pure Imagination is actually a re-release of 2005's Solid State Warrior with a slightly different track listing, so that's out too. (For those curious, all three would have probably placed in the 30s). I also have deferred some "2006" releases to 2007, most notably the new Ed James, which I have but haven't listened to yet and just came out in the last week or two; the new Cloud Eleven (which I don't have yet - hint, hint Ray Thank you Ray); and Buva's All That Humming, which I did feature a few weeks ago - although it's available from CD Baby at the moment, it has a nominal 2007 release date and the artist himself seemed somewhat surprised it was already up for sale. Also, EPs are not included (there will be a separate post in the next few days), nor are reissues, compilations, soundtracks, etc. Finally, there were a couple of fine releases that quality-wise are as good as many if not most of the top 100, but which were relegated to "honorable mention": Doug Powell's Four Seasons and Michael Carpenter's SOOP #2. The former because it was a type of b-sides/rarities comp, and the latter because it was a disc of covers. Again, both were fine discs, but I didn't feel right ranking them among the new discs of original material. Absolute Powerpop Readers' Top 10 of 2006. First of all, thanks to all of you who have expressed their condolences over the passing of my father. It was great to hear from all of you, and we're all doing as well as could be under the circumstances. A pretty clear cut top two, even given the relative small sample size. The Format appeared on the most ballots, but amazingly didn't get a single #1 vote. Both will be in my top 10, and the top 100 list is still on (probably to be posted next week). In the interim, I will likely post my favorite 20 songs of the year, although I won't be ranking them within the list. I felt I owe it to all of my readers as to what's going on with the lack of recent posting and all. Since my last post a week ago Friday, my father went into the hospital, and on Thursday morning, he passed away peacefully at the age of 75. He was a kind, wonderful, caring and giving man, and successful in two careers (except in between the two when a certain 13-year-old son helped push him into opening an ill-fated record store). I still plan on doing the top 100 year-end list, and the reader top 10 (thank you for all the responses so far) which will stay open until I actually make the post, so if you haven't submitted a list, there's still time. I probably won't be doing any "formal" reviews until after the first of the year, so for those artists who have submitted discs, I will be getting around to them in time. If something new and notable occurs that I can dispose of with a short post, I still may do that. For example, Kool Kat has just released new discs from Cloud Eleven and Ed James, which I recommend looking into. In the meantime, thank you all for your readership and patience. I want you, readers, to send me a list of your top 10 power pop (and I define that term quite elastically as you likely know, so you can as well) discs of 2006. Email me at the link over on the right of the page by December 18 (that's 10 days from now), and after all the lists are in, I'll compile the votes on a 10-9-8-7-6-5-4-3-2-1 points basis. You're also free to leave your top 10 in the comments to this post. I'll accept EPs, and stuff that came out in late 2005 (or things that were buried in 2005 before seeing the light this year, like Andrew LeDrew's Ladies Lookout). But no Sufjan Stevens, please. NAIRBATLTWA 2: Power Pop Boogaloo. The Skies of America-Shine. This is great crunchy power pop from Rob Bonfiglio's (Wanderlust) new band. I've heard the Velvet Crush and Matthew Sweet comparisons thrown around, but what keeps coming to mind when I hear this disc is Collective Soul when they were on top of their game (It almost seems too coincidental the disc is titled "Shine"). Plus, there's a cover of "Come and Get It". Come and get it at Not Lame, where you can stream the whole disc. The bonus offer may be over, but it's still worth buying. The Offramps-Hate It When You're Right. This band is out of Michigan but sounds like more Minneapolis, as in The Replacements circa 1986. And the price is circa 1986 as well, as this disc is going for a mere $7 at CD Baby. You can download three tracks (plus a Cheap Trick cover) at their website, and/or stream my favorite song from the disc, "Hallmark Holiday", at their myspace page. Central Services-Central Services. I'm probably giving these Seattleites short shrift here by not making them CD of the Day, so make sure you check them out. They have a Posies/Teenage Fanclub sound, and the acoustic ballad "Fun (While It Lasted)" makes me think they summoned Elliott Smith's spirit via Ouija board. Letting it play while I type here makes me think it'll make my top 100 list easily. Head on over to myspace, where you can download three tracks, or over to their site, where several other of the tunes are streaming. Or you can stream and/or buy at CD Baby. The Broken West (f/k/a The Brokedown) news. Perhaps you have noticed something a little bit different about our profile. We are no longer called the Brokedown. We are now The Broken West. This will take some getting used to. Here's the story, in an attempt to head off future explanations: The Brokedowns threatened to sue us if we didn't change our name. We're a real band, with a real record coming out, so we don't have a lot of time for frivolous lawsuits with wayward Nazi-youth punk bands. So we changed it. We hope you all can adjust, as we have (kind of). Anyway, the big news with The Broken West is that they're about to put out a full-length disc through Merge Records, titled I Can't Go On, I'll Go On, which is due out January 23. They have three tracks from the album on their myspace page, although one of them ("Down In The Valley") was on their great 2005 EP, The Dutchman's Gold. For more on that EP, and a couple of still-working mp3 links, head to my original post from March right here. In case you don't want to click through, here's what I had to say about them back then: "Although a lot of bands have both power pop and alt-country influences, they managed to create a fairly unique sound of their own that draws from the best of both. They cite Big Star, ELO, The Byrds, Rolling Stones, Wilco, Flying Burrito Bros. as influences, with good reason." The acronym above stands for New Albums I Recommend But Am Too Lazy To Write About. So I'll list 'em here with a brief comment and then urge you to check out the links. Paul Schneider-Forever Debts. It's not often that I make a power pop discovery through Pitchfork, but they did turn me on to this NYC artist who reminds me a lot of Tommy Keene. Sample at CD Baby (although it's temporarily out of stock). It's also available at iTunes. His previous disc, Escape Velocity, is available from eMusic. MySpace. Portastatic-Be Still Please. Speaking of indie pop, here's an oustanding disc from the side project of Mac McCaughan (Superchunk, co-founder of Merge Records). "I'm In Love (With Arthur Dove)" and "You Blanks" are two great tunes that will be on a "best songs of 2006" list that I'm toying with producing. It's on eMusic, which is also the best place to sample, although you can hear a few full tracks on MySpace. Minibar-Desert After Rain. This UK band by way of Santa Monica specializes in a pop americana sound in the vein of The Wallflowers, Del Amitri, Jayhawks, Gin Blossoms etc., and they put out a couple of major label discs earlier in the decade (perhaps you remember the minor hit "Holiday From Myself" - a great track, seek it out) before going it on their own. The new one is outstanding, and can be found on CD Baby. It isn't on eMusic, but is on iTunes. Also make sure you check out their myspace page: in addition to a couple of tracks from the new one, you can also stream their cover of one of Ryan Adams' greatest unreleased tracks (while with Whiskeytown) called "Choked Up". Well, here it is: the POWER pop record that many of you have clamoring for. 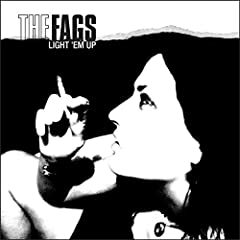 Detroit's The Fags have melded power pop in the Cheap Trick vein along with glam rock a la T Rex to come up with one of the best combinations of heavy rocking and melody to come down the pike this year. Aside from Cheap Trick and T Rex, you can hear traces of everything from The Raspberries to TSAR's first album. The disc has good distribution through Idol Records, meaning you can find it on Amazon (the best place to sample all the tracks) and all the other big etailers (or if you live near a hip enough store, probably there too). Or you can add it to your next Kool Kat or Not Lame order. 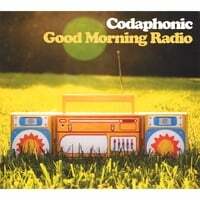 EP of the Day: Codaphonic-Good Morning Radio. This trio from Nashville has come up with a contender for EP of the Year. Good Morning Radio is Codaphonic's debut, but its craft and self-assurance could easily fool the listener into thinking they've been around for 10 years. The title track starts off things, and it's a great tune that doesn't outstay its welcome at nearly five minutes. The "ooh las" in the chorus and backing the verses, along with frontman Cody Newman's "do do do do" singalong about 3 1/2 minutes in, make it a transcendent pop song. One of the artists the band name-drops in its promotional material is Harry Nilsson, and while "Hollawalla Omacalla Wee" doesn't sound precisely like a Nilsson track, it embodies his goofy spirit in the service of a great pop tune. "Can We Talk?" is a punchy rocker; "Hearts Will Roll" has a title worthy of Westerbergian wordplay and a driving, herky-jerky rhythm; "Don't Be Surprised" is a Tories-inspired power pop gem, and the closing "Ritalin", with its piano-and-horns backing and satirical lyrics, will make Ben Folds insanely jealous the moment he hears it for the first time. The EP just became available in the last few days on CD Baby for a reasonable $7, and if you'd rather stream than download, the two tracks above plus "Can We Talk?" are on their myspace page.